I’ve compiled a FAQ that also includes my thoughts on a range of lutherie-related topics. Some of these may prove useful during the commission process, especially my opinions on tonewood combinations and scale lengths. Click on the headings below to expand | collapse information on that topic. I aim to build guitars that are vibrant, loud, and responsive -- producing a full, open tone with exceptional balance and clarity. In this effort, I have created a bracing design that allows the soundboard to remain very flexible but still have significant strength in key locations. For the back bracing, I employ a unique variation of the traditional ladder bracing. The most notable feature being a centerseam brace that runs uncut through each ladder brace and into a pocket at the headblock and tailback. It is my belief that this design helps the guitar resist rotation of the headlock and the consequent flattening of the back radius - a scenario which eventually requires a neck reset. Hide glue construction is used for the soundboard bracing, back bracing, and bridge joint. I build with double sides as in the tradition of concert quality classical guitars. Not only are there significant structural advantages to double sides (resistance to cracks and neck resets) but I believe there is potential for tonal improvement as well. The theory is that mass and rigidity help prevent the sides from wasting valuable vibrational energy and improve both volume and projection. Please Note: Double sides are not a cost cutting measure and should not be confused with the low-quality laminates found in entry-level guitars. On the contrary, double sides add more labor cost and material expense. I am currently using valuable Port Orford Cedar for the interior lamination due to its phenomenal stability and resistance to splitting. The overall design and structure of my instruments is based on solid engineering principles. I build very lightweight guitars that also manage to be exceedingly strong. The double sides and top/back bracing go a long way in preventing structural deformation from string tension. The neck construction is quite rugged and each of my guitars are built with neck angles that rest slightly above the height of the bridge giving excellent saddle height even with low action. I have spent years honing my woodworking skills and the result is that every joint in the guitar is carefully prepped and glued with accuracy and precision. Both the interior and exterior of my instruments display obsessive attention to detail and hand work that results in sharp, crisp lines. Custom nut and saddle widths are no cost options. Non-commissioned or "spec" guitars go out with a 1 25/32” nut width and 2.25" string spacing at the saddle. If you have moderate to large hands, you might consider a 1 13/16" nut width. Personally, I find this makes for a very comfortable fingerstyle neck. Another thing I do is ensure that the outermost strings are positioned an even distance all along the fretboard edge. The wisdom of this kind of layout becomes immediately apparent when string bending further up the neck. A custom neck profile is a no cost option. My standard neck is the approximate shape and depth of a Taylor neck. I would classify the neck as a C-shaped profile of moderate thickness. If you have a specific neck profile in mind, I can make an exact copy if you provide a template with dimensions -- contact me for "How To” instructions. For fret material, I have switched exclusively to Jescar who I think is making the finest fretwire available. I offer both their EVO Gold and regular Nickel/Silver fretwire. The EVO wire is longer wearing and is comparable to stainless steel wire in terms of durability. The Jescar Nickel/Silver wire is the hardest nickel wire available but is not as durable as the EVO wire. I don’t offer stainless steel fretwire as I believe the SS fret material imparts a slight tinny quality to the note. A couple years ago, I ran a quick simulation with one of my guitars using different fret material. I always thought it was very unlikely that fretwire could have an audible effect on tone. Nevertheless, my conclusion after this simulation is that SS fretwire imparts a slight “ping” during the initial attack of a plucked string. The only explanation I can think of is maybe the string isn’t staying seated against the SS fret due to its hardness but instead bounces or vibrates against the fret during the initial phase of the attack. The harder I plucked the strings, the more apparent this was to my ears. The overall tonal effect is a slight hollow quality during the first millisecond of the note. I was quite surprised at this result as I had used stainless steel frets early in my building career and didn’t perceive any difference. In fairness, I would say that most individuals would completely miss the tonal artifacts of SS fretwire. There are a number of suitable finishes for the acoustic guitar - nitrocellulose lacquer, shellac/French Polish, oil varnish, urethane and polyester. I have experimented with almost every finish type and my current favorite is polyester. The key advantage of a polyester finish is that it can be applied as a very thin film and still offer wonderful protection. The final film thickness of my soundboard finish is approximately 2-3 thousandths of an inch (half as thick as a sheet of paper). Furthermore, the finish is highly resistant to a wide-array of solvents and does not degrade over time like nitrocellulose lacquer . Polyester is also very resistant to checking and damage due to rapid changes in temperature or humidity. Another unique advantage of polyester is that the finish doesn't continue to sink into pores or glue joints (purfling, rosette, etc.) and will look just as good 15 years later. It is difficult to say what effect each finish type has on tone. I think the most important factor is that the finish is sprayed uniformly thin, especially on the soundboard. Regardless of the finish type, with a thin film the instrument has the potential to sound exceptional. I do offer a French Polish top as an option for my guitars. This finish is not for everyone as it is a delicate finish and offers significantly less scratch and ding protection than most modern finishes - however, it is relatively easy to repair. It is also not as easy/practical to produce a French Polish with the same level of cosmetic perfection as is possible with lacquer or polyester. The advantages of French Polish are its beautiful, organic appearance and the improvement it brings to the sound. French Polish doesn’t seem to dampen the vibrations the way other finishes do and this is why it is the only choice for a fine classical guitar top, which are more susceptible to energy losses. On my instruments, the French Polish top results in a more vibrant and responsive guitar. Please Note: I outsource my polyester finish work due to the toxic nature of the raw chemicals and the need for dedicated spray rooms and equipment. The individual I outsource this work to is a remarkably talented finisher and his work is simply as good as it gets. Regarding French Polish, I do all the finish work myself and this process takes me about one full month. It is very time consuming but I take the long, slow approach which results in a better quality finish. All my guitars ship with a custom-fit Ameritage case. I continue to be very impressed with the quality of these cases. They are built to very high standards and are without doubt, one of the nicer cases on the market. The plyboard construction of the Ameritage does make it quite heavy but the case does very good protection. For an upgrade, I offer Hoffee flight cases as a $700 option. The advantages of the Hoffee are its light weight, improved strength, aesthetic appeal, airtight construction, and a much improved interior fit. Of those advantages, the airtight construction is very desirable as it makes maintaining proper case humidity significantly easier. I also offer the Karura and Calton cases as alternatives to the Hoffee. The Karura has a noticeably stronger shell and is cosmetically superior to the Hoffee in almost every regard. However, the interior fit of the headstock region is not as spacious as the Hoffee case and will not accommodate Rodgers tuners on my short scale configuration. The Calton cases are one of the finest cases on the market - they are fairly heavy cases but offer incredible protection. I use a high-grade epoxy formulation for glue joints with oily woods like Cocobolo. I also use epoxy for the side lamination process, for gluing the fretboard to the neck, and for the headstock veneers. Epoxy doesn't contain water as do most glue formulations (hide glue and PVA glues like Titebond) and this completely eliminates the possibility of warping during the gluing process. I use hide glue for most of the joints used in the body of the guitar - joining the plates, bracing, bridge, etc. I don't actually believe hide glue improves the guitar’s tone as some say due to how hard it dries. PVA glues like Titebond dry very hard albeit not quite as hard as hide glue. However, a proper glue joint should not have any sort of visible glue line between the parts but rather serve as a microscopic bond between two carefully matched pieces of wood. Based on that fact alone, I find it unlikely that any sort of tonal improvement could be gained from using hide glue over other hard drying wood glues. IMO, the real advantage of hide glue comes from its usefulness during repairs, allowing new joints to form over old joints without the removal of old glue. It also doesn't cold creep, which is very advantageous for the bridge joint. Intonation refers to the pitch accuracy of an instrument. As most players are aware, the act of fretting a string increases the string tension and causes the pitch to go sharp. For this reason, the saddle is moved back from its theoretical position to lengthen the scale length to compensate for the sharpening effect of fretting a note. However, this slight increase in scale length then causes problems for the open strings. The above is a simplified description of the problem but should give you a feel for why intonation is necessary on a steel string guitar. The bottom-line is there are several ways to go about achieving good intonation. I have settled on the following solution which I think yields very good results. I move the entire nut forward slightly from its theoretical location and intonate the saddle based on the string’s note at the octave. It is also important to note that having a perfectly flat fretboard with very little neck relief and low action at the nut help eliminate some of the biggest contributors to poor intonation. This is a question that seems to frequent the various online guitar forums. First of all, to be semantically correct, the entirely handmade description does prohibit the use of power tools. However, I think most people use the term to imply that an object is carefully crafted by an artisan rather than mass produced in a factory. The majority of the work I do is powered by my own strength rather than electricity. I use an array of chisels, files, rasps, saws, scrapers, and planes to prep the various parts for assembly. However, I also employ an assortment of power tools for specific operations and also to do the basic prep work for most aspects of construction. Some of my processes incorporate mostly hand tools and others mostly power tools. For example, in the manufacturing of the headblock and tailblock, I use a bandsaw, disc sander, and drill press for most of the work and only use a small block plane to fine tune the surfaces. For the neck profile, I use a bandsaw and a shaper to dial in the neck thickness and then use a spokeshave, chisels, rasps, sandpaper, and scraper to carve the neck, heel, and volute. Regarding CNC equipment, I currently use this equipment only for the creation of my fretboards and this process is outsourced. CNC equipment is a bit of a mixed bag. On the one hand they are incredibly useful but they also substitute computer/programming skill for woodworking skill. There are certain things that CNC's can do that no human can accomplish. For example, a CNC can slot the fret locations to incredible accuracy and also have the fret slots follow the radius of the fretboard thus producing a stronger fretboard. They can also route a fret slot just shy of the fretboard's edge so that no binding is needed to hide the fret tang, yielding a very clean look which I like. CNC's are also incredibly useful forcomplicated inlay work and template/jig creation. Both power tools and CNC's create new possibilities but also lower the woodworking skill needed to manufacture a component. Most power tools still require a tremendous amount of technique to use and I personally view them as a great way to speed up what would otherwise be mostly grunt work. CNC's are wonderful tools but you absolutely lose a human component with their incorporation into a process. I believe they are invaluable for certain part manufacturing and inlay (which is quite expensive when done entirely by hand) but also believe they can turn the build process into assembly work if every part is milled on a CNC. Nevertheless, the assembly process itself requires a great deal of woodworking skill. The binding process alone is something that would be a tremendous challenge for most woodworkers. In conclusion, I think that all of these tools have a place in the shop of builders but I hope that the use of automated tooling is selectively utilized and never entirely replaces the use of hand tools. My guitars are built with a mortise and tenon bolt-on neck with the fretboard extension glued to the soundboard. My personal opinion is that the fit of the joint is more important than the style. In a good neck joint, the neck is held tightly against the body of the guitar. Both dovetail and bolt-on style joints achieve this in slightly different ways but the resulting structure in a well-prepared joint is nearly identical. The reason I use a bolt-on neck is because it is much more repair friendly. Structurally, there is another advantage to the mortise and tenon style joint that I like. I am able to make a fairly deep tenon for the neck and by inserting a mahogany dowel through the tenon region (in the direction of fretboard to heel), I can provide plenty of strength in one of the weakest areas of the neck. Sound is a very subjective thing and very difficult to discuss without a point of comparison. My early work sounded very good. The volume was excellent and my guitars were vibrant and responsive. They had a big, open sound and were Lowdenesque in terms of their timbre. Early on, I think my biggest struggle was obtaining a fat treble response. In late 2009, I introduced my Modern OM guitar model. Tonally speaking, this design was a radical departure from my previous work and my focus shifted to a much more articulate and balanced sound with a fatter treble response. I have since continued to seek improvements in this new tonal direction and have been incredibly pleased with the results. The aesthetics of good design might seem obvious but let me assure you - it is easy to build an ugly guitar!!! I think that I have always had a sophisticated design sense but recognizing good design and creating it are two entirely different things. I have always tried to walk my own creative path and I credit that decision with helping me to grow as an artist. Over the years and through myriad design iterations, I have gained an understanding of what does and doesn’t work well in the context of a guitar. In particular, proportions and overall design coherence are incredibly important to me. I lean towards a clean, modern style and have a body shape and supporting elements (headstock, bridge, rosette, neck/heel, etc.) that work well with that aesthetic. I built a number of what I call prototype guitars while I was still a novice/amateur builder. The build quality was decent but inferior in many respects to your typical Martin or Taylor. I was primarily concerned with gaining experience rather than making perfect instruments, especially since I was not charging anything for my time. All of these guitars were sold at material cost plus a couple hundred dollars for shop expenses. You can easily recognize my prototypes because of their unusual looking pinless bridge design. I have noticed that a few of these guitars have been bought and sold several times over the years and have watched the asking price increase dramatically. My only concern is that these prototypes are sometimes referenced as being a good deal in comparison to what my current guitars sell for. I want to make it clear that these early guitars are in no way representative of my current instruments nor are they covered under warranty. The advantage of the 24.0” short scale is improved ergonomics for the fretting hand, especially with difficult chord formations. However, the short scale requires a heavier gauge string set to create the necessary tension with the end result being a nearly identical overall tension as the longer scale. Interestingly enough, the short scale is still easier to fret despite having the same overall string tension. There are some noteworthy tonal considerations regarding scale length. Without doubt, the longer scale does sound better. The high-end is very sweet on the short scale but there is a decrease in the bass response. The overall effect is what I would call a smaller “soundstage” (to borrow a term from the audiophile community) with the short scale yielding a less grand/expansive sound. The decision to go with a short scale is, therefore, a personal choice regarding the value of the ergonomic benefits gained. If at all possible, I recommend you strongly consider the multi-scale option if you are commissioning a short scale instrument. 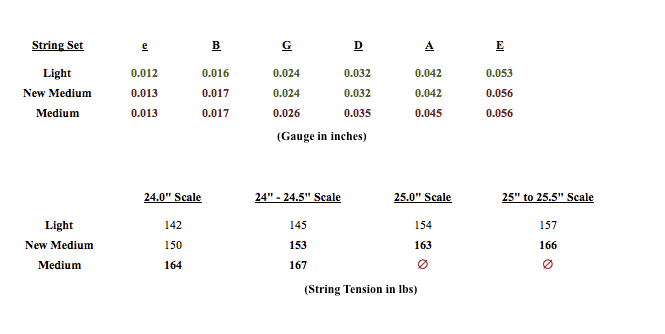 The charts below provide information on string gauge sets and give the string tension at multiple scale lengths. Please note that the tension chart is based on standard tuning. For example, medium gauge string sets are not allowed on my regular scale guitars in standard tuning but if you are playing in dropped tunings then they would actually be recommended. The value of the John Pearse New Medium string set is that it is a mixed light/medium gauge string set and is an even tension set. The benefit of this string set is that it sounds great both in standard tuning and in dropped tunings. As such, I recommend that most players just stick with the JP New Medium, Elixir HD, or similar light/medium mixed gauge set. While runout isn't a structural or tonal issue unless it is severe, I strongly dislike its appearance and go to great lengths to find soundboards that will have a perfect color match across the centerline. Once you become aware of runout, you will notice that a large percentage of acoustic guitars have it and that it was also quite common in older instruments as well. Unfortunately, it is very difficult to source Adirondack, Engelmann, and European Spruce tops without any runout. I often place very large orders for the highest grade tops when they become available and keep only 5% or less of my order. I reject many beautiful tops with exquisite grain just because there would be a slight color variation across the center joint. The process of eliminating soundboards with runout is quite difficult. I spend many hours combing through a soundboard order to determine which tops don't have runout and that also meet my other soundboard requirements (light, stiff, cross-grain strength, and good cosmetics). Despite my best effort, I still sometimes find that tops with a little bit of runout will slip through -- these tops get noticed after they are joined and fine sanded. Rather than proceed, I discard the top and continue on with a different top that doesn't have any runout. Under my current price structure, I actually make less profit with the Engelmann and European Spruce top options when compared with the base Sitka Spruce top, which are much easier to source without any runout. As is typical of the rest of the industry, I have seriously thought about allowing some runout in my soundboards. Eliminating severe and moderate runout is easily accomplished as it is very noticeable and quickly identified. Nevertheless, I personally feel that much of the aesthetic value of my guitars comes from a beautiful top with perfectly even color. Soundboard runout breaks the visual coherence and I know I just wouldn’t be happy building an instrument if any runout were present. Please Note: My comments about runout are restricted to a viewing angle that is roughly perpendicular to the soundboard surface. It becomes an impossibly difficult task to locate soundboards that won’t show some color differentiation across the joint when viewed from acute angles. I notice this quality more with Engelmann than any other Spruce species, especially in tops with a lot of medullary rays and shimmer. For most options/upgrades, the upcharge is due to additional labor. However, the pricing for tonewood options is a little bit different. I see this question asked often on internet guitar forums and some guitar players seemed genuinely confused as to why there is a discrepancy between the actual cost of the upgrade to the builder and the cost to the customer. The short answer is that the price structure is based on the dynamics of running a business. For example, most luthiers have a sizeable inventory of very expensive tonewood and sound business principles state that this capital investment must turn a profit or else it becomes a poor investment. There are also other considerations that affect pricing such as the workability of the piece, how long it stays in inventory, and replacement cost if the wood is damaged during construction. Furthermore, the cost of instrument grade tonewood can vary dramatically and is continually on the rise. Over the years, I have collected some of the finest back/side sets you will ever find and some are literally irreplaceable. I have priced these sets accordingly but please realize that there are cheaper options available if you desire. For example, I quote Cocobolo as an $1,500 option but that is for the middle quality range. It is possible for me to offer Cocobolo for as low as $750 and as high as $3,000. The same applies to most other tonewood species. I would like to discuss the warranty concept in greater detail. Almost every manufacturing defect will quickly reveal itself after the guitar has been strung up. Issues such as finish problems, bad glue joints, poor neck geometry, bad fretwork, and unstable soundboards/backs should all be evident within the first six months of ownership. My track record for quality is excellent — to date, I have only needed to do one small cosmetic repair for one of my guitars. However, I have had several customers contact me regarding problems with their instruments relating to action and neck angle problems. Every single situation was quickly resolved when the clients realized they were not properly humidifying their instruments. In all of these circumstances, the customers thought they were being diligent but we came to discover the RH was closer to about 65% or higher. The end result of such care is most certainly an instrument with a weakened structure along with potential finish issues and small cracks in the top/back. A weakened structure might result in braces coming loose or possible neck angle issues. Guitars are simply not built to expand and contract over and over and still maintain their correct geometry. In fact, once a guitar has become severely wet or dry, chances are it will never return to its original form. Please note that the warranty does not cover problems caused by excessive humidity or dryness. If you have any questions about how to accurately measure the relative humidity and ensure a stable RH environment, I would be more than happy to discuss the topic with you. What Wood Combination Should I Choose? Rather than providing an in-depth analysis of the various wood species, I think it is best to focus on what I consider to be the main tonal difference between wood species — their overtone complexity. The subjectivity of tonal discussions makes any kind of concrete observations very difficult. The reason I focus on overtone complexity is that it is a fairly easy way to choose a suitable wood combination and it is a comparison-based approach. You will likely never get folks to agree on what specific qualities Mahogany and Rosewood each possess but most everyone will agree that Rosewood has more complexity and depth. The first step in choosing a tonewood combination is to figure out whether you prefer Spruce or Cedar/Redwood. Regardless of the tonewood used for the back and sides, the soundboard will still be the primary tonal determinant. It is far easier to hear this difference than to explain it; therefore, I suggest going out to a guitar store that carries a consistent brand like Taylor and trying identical models in every way except for the top. Spruce | Rosewood is the combination that 95% of players will prefer above all the others. This combination is very versatile and has a clear, rich tone that sounds great with the vast majority of genres and playing styles. More specifically, Adirondack | Brazilian RW has one of the most perfectly balanced tones which is why it is often referred to the Holy Grail of tonewoods. However, that same degree of complexity can be closely mirrored with much more affordable tonewoods. I would like to conclude with three wood combinations that I find very enjoyable and also recommend the following article by luthier Dana Bourgeois. It is an excellent article that you may find useful. This combination is king for a reason. Without doubt, the most versatile sound and the tone that the majority of players will prefer. It yields a very balanced sound with an articulate and rich voice. This is also the combination I highly recommend for individuals who are buying their first high-end guitar. This combination gives you the lively response and warmth of Redwood but the overtone complexity is held in check by the punchy and fundamental tonal properties of the back. This is an incredibly versatile sound and a favorite among Celtic guitarists. It also excels at strumming and dropped tunings. I generally find that most factory-built Spruce/Mahogany guitars sound a bit too plain and the result is a sound that comes across as thin and strident. In contrast, my instruments are built to be exceptionally vibrant and my Mahogany guitars always sound very full and musical. The tone is more direct without the Rosewood "reverb" but there is a warmth and clarity in the tone that is quite enjoyable.